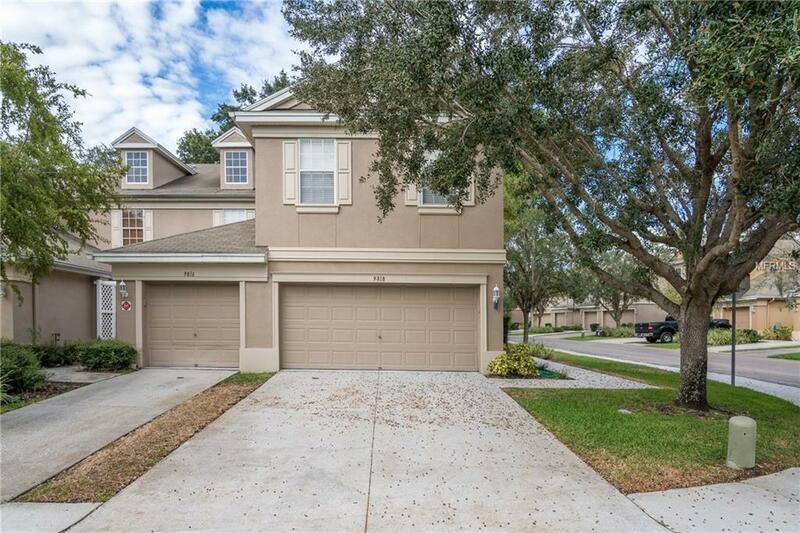 Beautiful and Spacious 2 bedroom, 2.5 bath, 2 car garage townhouse with a large bonus room upstairs in the sought after Sabal Pointe Community. This home is an end unit located on a corner lot with a covered screened-in patio, accessed by sliding glass doors from the living room. You have two points of entry into this home, one from the side and another through the garage for added security. As you enter the home the large kitchen area is open with plenty of counter top space, tile floors and solid wood cabinets. A nice breakfast nook in the kitchen, along with a high top bar area give you plenty of eating space. The large living room is perfect for entertaining and relaxing. The entire home is positioned so that you have a lot of natural light throughout the day. The first floor also has a half bathroom. As you go upstairs, the split bedroom floor plan has a very large bonus space between the two rooms that you will absolutely love. Each of the bedrooms are large with high ceilings and offer full baths. The laundry room, which includes the washer and dryer, is also located upstairs for convenience. The community pool is gated, private and offers bathrooms as well as shaded areas to relax throughout the year. The community is very well taken care of with manicured landscaping and mature trees throughout. Sabal Pointe is close to I-75 & I-4 for easy access to Brandon, downtown Tampa, Tampa International Airport, shopping, dining and more. This home will go FAST so please call me today to show it! Additional Lease Restrictions Contact Hoa Property Management Company For Any Pet Or Leasing Restrictions. Avid Property Management Can Be Contacted At 813-868-1104. Pet Restrictions Contact Hoa Property Management Company For Any Pet Or Leasing Restrictions. Avid Property Management Can Be Contacted At 813-868-1104.